Uganda’s top safari park, Queen Elizabeth is the one must-visit on any Ugandan safari. It still can’t boast wildlife numbers like the best Kenyan and Tanzanian parks, but there are plenty of big animals here and it has one of the highest biodiversity ratings of any nature preserve in the world. This includes an incredible 612 bird species. Nearly every visitor takes a boat trip on the Kazinga Channel where the hippos and crocodiles are the stars, but buffaloes, elephants, lions, leopards and just about all other animals might be seen. Wildlife drives are best in this northern region, but the famous tree-climbing lions are only found in the distant Ishasha region. You’re more likely to see them here than any other place in Africa, though it’s far from guaranteed, as I can personally attest since I struck out on my quest to find them, even though my guide seemed to know every tree in the sector. But, the search was still rewarding since there were plenty of other animals around including a lot of elephants. My favorite place at QENP is the jungle-filled Kyambura Gorge, a beautiful slice of green in the savannah with a habituated troop of chimpanzees adding some variety to the typical safari experience. Staying inside the park at Mweya or Ishasha puts you in prime wildlife territory, though the lodges atop the Kichwamba Escarpment have inspiring views over the park and out to Lake Edward and the Rwenzori Mountains. Despite the diversity of its wildlife - ranging from hundreds, sometimes thousands, of Ugandan kob in the northern Kasenyi Plains, to chimps at Kyambura Gorge in the east, tree-climbing lions at Ishasha in the south and over 600 species of birds in between – Queen Elizabeth National Park is quiet and quite serene. True, the wildlife may not be as copious as some Kenyan or Tanzanian parks, but the Big Five are all here aside from rhinos. Although the best place to see lions is around Kasenyi Plains with their well-stocked larder of kob, the tree-climbing lions in Ishasha are a special sight - when I saw them dozing nonchalantly on the boughs of a fig tree, I stayed for an hour, mesmerized. A boat trip along the Kazinga Channel stretching between Lakes George and Edward is a must for any bird lover – within 20 minutes we saw at least 40 different species. 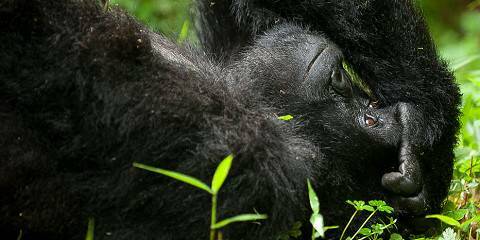 Scenically, the Park is as diverse as its residents, lying in the shadows of the Rwenzori Mountains on the floor of the Albertine Rift Valley, with myriad crater lakes scattered around along with areas of open savanna and the tropical Maramagambo Forest, home to several primates. 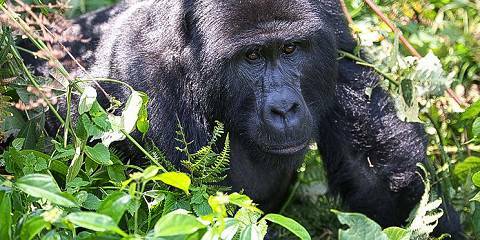 Despite this being Uganda’s most well-known and regularly visited wildlife area, it is far from overcrowded. What I like most about Queen Elizabeth is that it boasts a spectacular array of habitats and landscapes for tourists to appreciate. Boat cruises along the game-rich Kazinga Channel are a perennial favourite with wildlife enthusiasts and birders alike. On a clear day you can see all the way to the Rwenzori Mountains, but there’s no need to travel that far because volcanic features dominate sections within the park. The result is a stunning landscape peppered with crater lakes best appreciated from the air. The Kyambura Gorge on the edge of the national park is also a good place for tracking chimpanzees. But, without doubt, my favourite part of the park is the wild Ishasha sector: famed for its tree-climbing lions, which can regularly be found hanging out in the shady figs along the main road. This is a park with plenty of wildlife and lots to offer the discerning safari aficionado. Queen Elizabeth National Park offers amazing diversity in a small area. In the heart of the park high on a cliff over-looking Kazinga channel between Lake Edward and Lake George sits Mweya Lodge. I could sit here all day, watching elephant and buffalo coming to drink at the river below. But there is a whole park to explore; new drama is unfolding the whole time and who would want to miss all that? 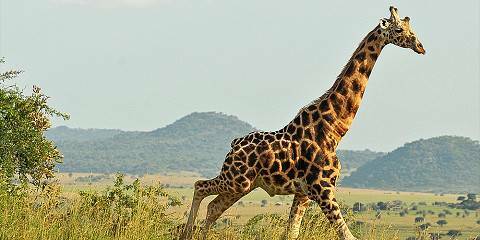 The Kasenyi plains are a good place to start for savannah animals. These plains below the Mountains of the Moon are dotted with Uganda kobs, and lions lurk around every corner preying on these abundant snacks. Moving away from the plains, you can drive a circuit taking in some of the beautiful forested crater lakes. Further away you can hike down the impressive Kyambura Gorge, home to chimpanzees and other forest dwellers. My favourite area in the park is the more remote and little visited Ishasha sector. This place is renowned for tree-climbing lions and contrary to some other parks that have this reputation, finding lions on a tree isn’t that hit and miss here. I’ve regularly found a whole pride of about 8 lions high up one of the comfortable sycamore figs that are common in the area. In fact, during a weeks visit, I would usually find them, leaving the river area mid-morning, where they would have drunk after their kill at night, heading for one of their favorite trees. These creatures can be as predictable as your tabby house cat! I can’t think of any other African park that packs quite so much biodiversity into a relatively small area, an impression backed up by an astonishing checklist of 610 bird species – reputedly the most of any African park, despite QENP being only one-tenth the size of the likes of Kruger or Serengeti. 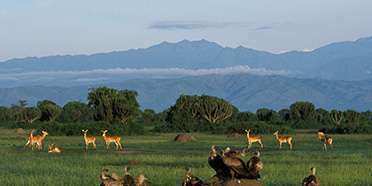 The Mweya Peninsula, site of the most established of several dozen lodges set in and around the park, is the base for boat trips along the lovely Kazinga Channel, which swarms with hippos and elephants, and – weather permitting – offers distinct views of the snow-capped Ruwenzori Peaks. Game drives on the Channel Drive north of Mweya can be a bit hit-and-miss, but I've often seen elephants, lions and leopards in this area as well as families of the localised giant forest hog (one of the few sites anywhere in Africa where this massive swine is regularly seen in daylight hours). Far more reliable for game drivers, only an hour from Mweya, is the Kasenyi Plains, which host large numbers of lion, buffalo and Uganda kob. Other highlights? There’s the scenic Maramagambo Forest, set in a field of beautiful crater lakes, and home to many forest birds, as well as Kyambura Gorge, with its chimpanzees. But my favourite part of the park is the Ishasha sector, a remote wilderness area where I’ve encountered tree-climbing lions – up to 12 in one tree - on about 80% of visits. My favourite activity at Queen Elizabeth is the boat ride on the Kazinga Channel. It’s said to contain the world's largest concentration of hippo, and you can watch thousands of them practically piled on top of each other in the shallows; this is where to get that photo of a hippo yawning. We also saw elephant, buffalo and waterbuck ambling down to the water to cool off, while keeping a wary eye on the many crocs. The water’s edge also attracts thousands of birds, and from our boat I saw malachite kingfishers, fish eagles, and marabou storks that were bigger than the children in the local fishing village. Another attraction is the Uganda kob mating grounds, where hundreds of male kobs battle it out, locking antlers and gnashing teeth, to stubbornly defend their harem. It’s not unusual to see lion preying on the grazing females or arrogant males. Uganda isn’t really thought of as a classic safari destination in the way Kenya and Tanzania are, but Queen Elizabeth National Park proves the doubters wrong. This large park offers extraordinary diversity in its wildlife, landscapes and experiences. You could watch lions climbing trees (one of the only places they do this) at dawn, track chimpanzees at lunch and take a boat ride to view hippos in the afternoon. Whilst wildlife numbers don’t compare with the Serengeti or Masai Mara this is still a very well stocked park. Ugandan Kob are two a penny and the lions that feast on them are surprisingly easily seen (I think I have seen lions on every day of every visit), elephants are also very likely to be encountered and then there’s the hippos. With lots of waterways, pools and lakes hippos and crocodiles are very common and by taking a boat ride down the Kazinga Channel you’ll be able to marvel at literally thousands of hippos and crocs as well as a multi-coloured rainbow of water birds. One of the unexpected attractions of this park are the habituated chimpanzees living in the tree stuffed Kyambura Gorge. Sometimes they emerge onto the surrounding savannah and when they do so they may even walk upright. A look back at our earliest ancestory if ever there were one! Queen Elizabeth is also relatively easy and cheap to visit. So, with so much going for it are there any downsides? Not really in my opinion except that the park does lack that sense of space and wilderness that you can savour in some other East African parks. The best way to get an early feel for Queen Elizabeth National Park is to join the two-hour boat cruise up the Kazinga Channel, which runs between Lake George and Lake Edward. Birdlife is fantastic but the whole journey, especially if you go at sunset, is filled with sightings of watering elephants, buffalo, hippos, crocs and various antelope. Queen Elizabeth is about 2000sq km and some of the outlying country (at greatest distance from the lakes) is extremely wild and barely travelled. It can take some serious 4x4 driving to get to some parts of the park but is worth the mission if you have the opportunity to explore these areas. A definite highlight of the area is a walking safari in Kyambura (Chambura) Gorge where you can see several primate species – with undoubtedly the most spectacular being chimpanzees. Famed for its tree-climbing lions (and yes, seeing a lion sitting in a tree does look weird), Queen Elizabeth has a marvellous array of wildlife and you’re even a good chance of spotting a leopard here on a night drive. There’s wildlife aplenty including most of the Big Five (no rhino). A boat trip along the Kazinga channel is a great way to enjoy the birdlife flitting along the banks, including kingfishers divebombing into the water from overhanging tree branches. Along the shoreline one of our group spotted a leopard lazing on a tree branch in the late afternoon. Another highlight of this park is Kyambura Gorge, a kind of swampy, humid, forested lost world where a community of chimps swing from tree to tree with abandon. Although you are a better chance to see chimps in Budongo or Kibale this location is much more atmospheric. We stumbled across a family of chimps within 15 minutes of entering the gorge – the fury primates swung around us in the forest and even came down for a closer look near the river. A very fine national park with a diversity of experiences, activities, wildlife and adventure.